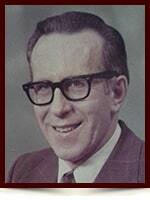 Dr. Jacob Alfred Johnson - Edmonton's Burial & Cremation Professionals | Trinity Funeral Home Ltd.
Dr. Jacob Alfred Johnson, 86, of Edmonton, AB went to be with the Lord peacefully on September 23, 2014. Jake was born in Castor, AB on March 8, 1928 to the late Charlie and Alice Johnson. He received a Doctorate of Theology, was ordained as a pastor and traveled the world as a missionary, spreading the word of God with his wife, Donelda, at his side. Their marriage of 58 years has been a testament to many of true love, commitment and servitude to God. Jake is survived by his wife, Donelda, daughter, Shirley and grandchildren, Sukhi, Raji (Adrienne) and Kinni. He also leaves behind many nieces, nephews and grand nieces and grand nephews. Dear Donelda, whle searching the internet I came across the news that Jake had passed on. It’s been a long time since we’ve been in conact and althogh I tried to find you and Jake through the Baptist Missions I had no success. I am sad to hear your sad news and have you in our prayers. Please feel free to contact me when you get this message.